Ex-Ugandan Vice President, Dr. Gilbert Bukenya, has waded into Nigeria’s 2019 elections and according to him he would have voted for Atiku Abubakar if he was a Nigerian. 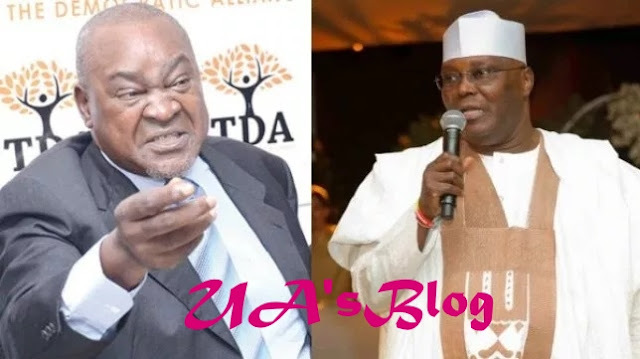 Dr. Gilbert Bukenya who served as the Dean of the Faculty of Medicine at Makrere, said he was left with so much to contemplate, during his encounter with Abubakar, that he never stopped thinking of how Nigerians are so lucky having the person of Atiku Abubakar as a Nigerian. “I have rubbed shoulders with several African Presidents and Vice-Presidents. I have participated in many conversations with these men – both formally and informally. Some of these conversations have attracted attention and many have been amusing – but very few have included intellectual and analytical discussions of substantive issues. Seldom in these conversations does one hear about the conditions and needs of the country’s poor. In 2005, I met a man at his residence in Abuja, Nigeria, who surprised me. He welcomed me with a guarded smile and went straight to business. He was smart, eloquent and very knowledgeable. I was struck by his consistent reference to “my people.” He was so concerned about the poor. He discussed impacts of educational injustices and weakened agricultural practices in Nigeria. Our conversation ended and we parted. While I left him with some traditional Ugandan gifts, he left me with much to contemplate. This Nigerian “big man” had sounded so earnest and completely devoted to “his people”. Surely, I was surprised and he has left a lasting impression. We have remained friends over the years and I have observed his business and political dealings over time. I have noted the tremendous value that this man, Atiku Abubakar, has contributed to Nigeria’s development. He has been a philanthropic leader and a determined and passionate advocate for improving the national educational system. I heard recently with great pleasure that he is running for the Presidency in the upcoming Presidential elections.